How can I create a bibliography for sources in my library? First off, as you are working on each source, click on the Citation sidebar tab ( ) and complete any missing information before you save the page. 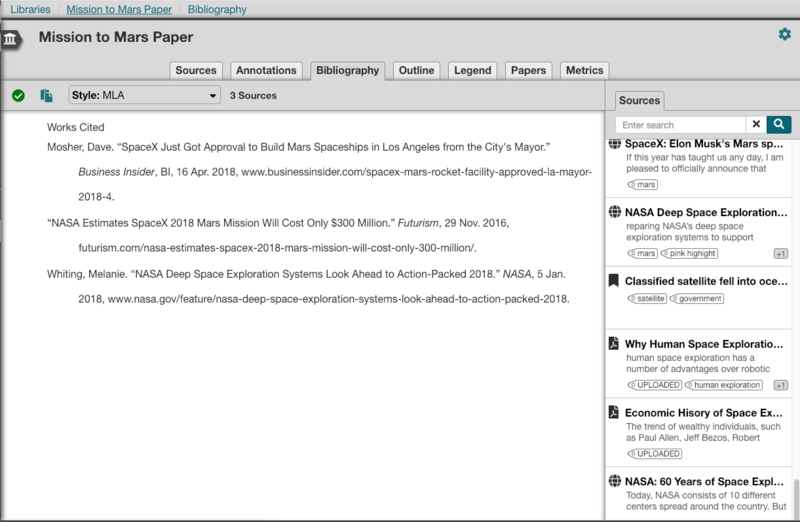 You can also edit the citation data for sources in your library (including bookmarks and uploaded documents) by clicking on the edit icon that appears along the right side when you hover the source for that item and then selecting the Citation tab. This will show you a preview of the citation as you edit it. For Edu plan users: To generate a bibliography for multiple sources in your Library, select the sources (by ticking the checkbox to the left of each source) and then click the "Create Bibliography" button. This bibliography can be copied and pasted into Word or Google Docs and it should preserve the correct formatting. If you need to generate it again later, you'll need to re-select the appropriate sources and generate it again. For Edu Pro plan users: Each Library has a dedicated persistent bibliography in the Bibliography tab of the library. To add sources to the bibliography, in the Sources tab of the library, you can select the sources and click the Add to Bibliography button. Or you can go to the Bibliography tab and use the Bibliography editor (see screenshot below). You'll see a list of all sources in your library along the right side. Simply drag and drop those sources into the Bibliography or click the + button that appears when you hover one and it will be added into the bibliography in the correct order. If you need to remove a source or edit the details, hover over it in the bibliography and use the Edit or Remove buttons that appear along the left edge ( ). Note that any Google Docs that you use with our Scrible Writer Google Docs add-on associated with this library will sync with this bibliography, so adding sources in the Google Doc will add them here and adding them here will cause them to appear in the Works Cited page of the Google Doc when the add-on refreshes next.